Before I even start to think about Lenten Resolutions, I need to pay attention to my New Year’s Resolutions. With only two days to go to Sash Wednesday, and six weeks after New Year’s Day, I am still falling behind my good intentions and not meeting my resolve to increase my daily walking average. I had managed to get up to 3 km a day last year, but by last night my weekly walking average had only increased marginally, to 3.6 km, and this evening it has reached 4.1 … a marginal improvement, given my daily average for this year so far is 3.5 km. But an app on my ’phone that allows me to keep a good watch on my daily averages. It almost acts like a conscience, telling me I have still have a long way to go, literally, to meet the commitment I made to myself at the beginning of this year. I managed to reach 10.2 km one day last month in Lichfield, and 10.1 km a week later in London. But my ’phone reminds me constantly I need to do better – that I can do better. Today has been anything but a sedentary day, with a walking tour through Limerick, leading an interfaith group on visits to churches, mosques and sites associated with the Jewish community. Already, today’s walking distances total 7.1 km, and things are looking a little better. And at the weekend, despite the intermittent snow and rain, two of us managed to go for walks along the country lanes around Askeaton on Saturday, and I clocked up a total of 6.1 km by the end of the day. We walked as far as the former railway station and the old railway line that once ran from Limerick to Foynes, and I wondered yet again why West Limerick could not revive this service, like the old Harcourt Street railway line in Dublin. A Luas-style or Dart-like rail journey from Askeaton to Limerick would take less than 30 minutes, but would ease housing pressure on Limerick, bring new life into many of the villages and towns of west Limerick, and ease the pressures on the narrow roads in this area. 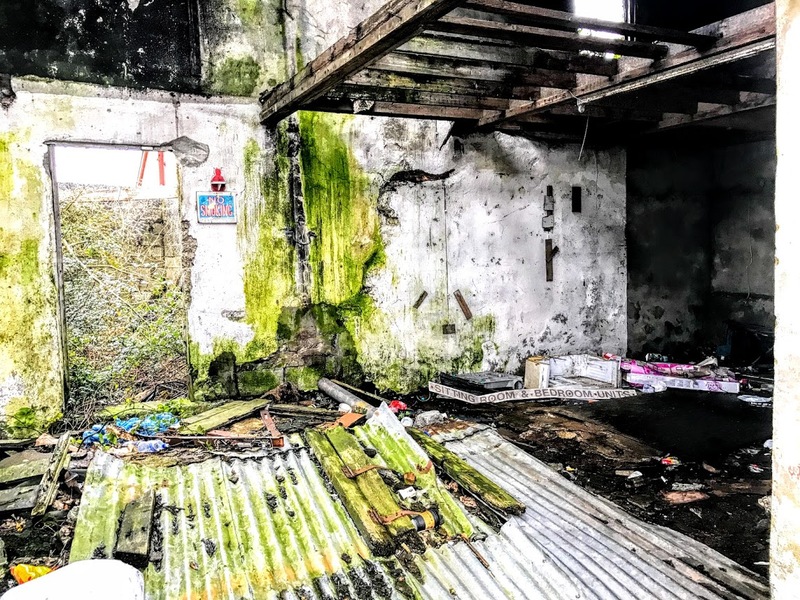 Close to the site of the old quarry near the Kingspan factory, we looked into an old workshop that has been abandoned but must once have been home to a thriving business. We returned too to Abbey View, behind the leisure centre and the swimming pool, to have a second look at an old factory and some forgotten cottages I had photographed last week. 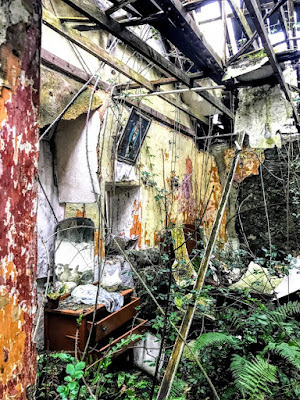 We decided to peek into the cottage that has a tattered lace curtain fluttering through a broken window. 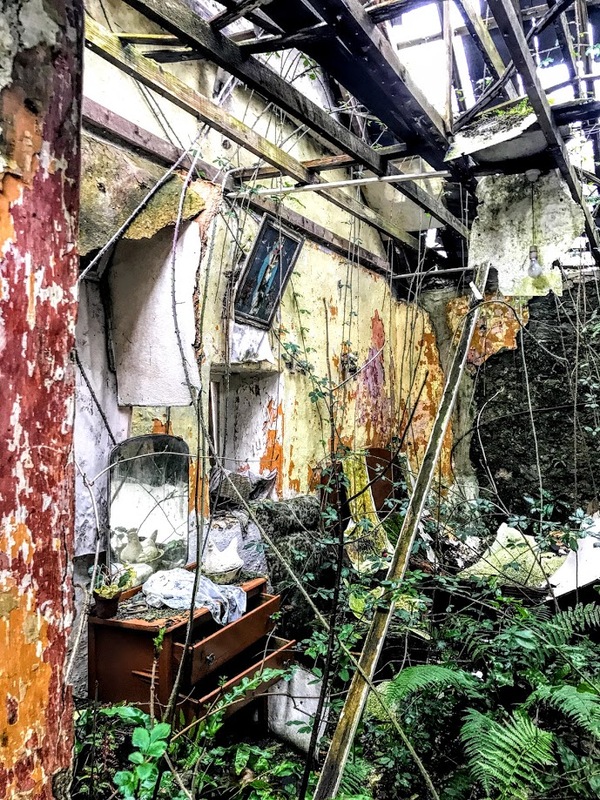 Inside, a ‘holy picture’ still hangs on the kitchen wall, the furniture is still in place, opened drawers were never closed when the last person left and closed the doors, and sitting on the dresser is a Delph hen that must have once held eggs, ready for breakfast. 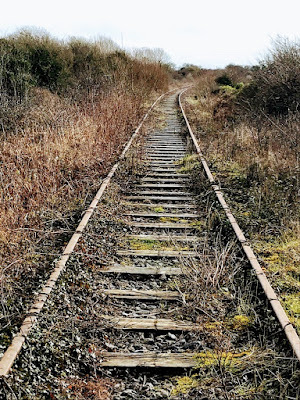 These towns and villages in West Limerick could do with an economic boost and fillip, and the old railway line offers the potential to bring new life into these towns and villages.